The explosive growth of public cloud computing is transforming enterprise IT infrastructure. Organizations are finding it difficult to manage workloads and the proliferation of snapshots with the native tools offered by most infrastructure as a service (IaaS) cloud providers. What is Cloud Snapshot Manager? Cloud Snapshot Manager is a SaaS solution that makes it easy to protect workloads in public cloud environments – without requiring any installation or infrastructure. Customers can discover, orchestrate and automate the protection of workloads across multiple clouds based on policies for seamless backup and disaster recovery. Dell EMC breaks cloud silos, allowing customers to use one tool for the protection of workloads across multiple clouds. Designed for any size cloud infrastructure, CSM scales as your organization and data grows. The automatic assignment of resources to protection policies based on tags is essential to achieve auto-scaling in the cloud with the peace of mind that your resources are protected. How does Cloud Snapshot Manager Work? In the middle are the resources that are running in the AWS or Azure cloud. 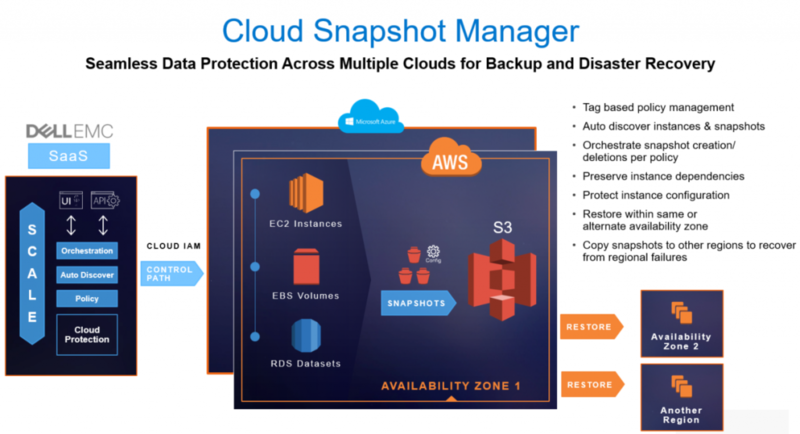 Snapshots are a key mechanism by which resources are protected in the cloud, primarily due to the fact that when snapshots are taken, AWS copies the data from EC2, EBC and RDS to a special snapshot bucket in S3 and for Azure from managed disk to a standard Blob store, separating the primary data from the secondary copy of the data. The initial snapshot is a full copy and all the subsequent snapshots are incremental in the case of AWS. Cloud Snapshot Manager runs inside Dell EMC IT infrastructure with the highest level of security and control. Cloud Snapshot Manager micro-services use the APIs offered by AWS or Azure to discover instances and create or delete snapshots per policy. Similarly, for restores, API calls are made to create the VM image from the snapshot. It is important to note that the data will always remain in the cloud and would never leave that environment. What are the benefits of CSM? CSM is designed from the ground up for any size cloud infrastructure and scales as your organization and data grows. The following are a few benefits of CSM. Cloud Snapshot Manager is breaking cloud silos and providing a better way to consolidate and manage the entire lifecycle of snapshots and recovery from a single management console. If you would like to demo CSM hands on we have a free 30-day trial. If you would like to learn more about CSM check us out online. Lastly, check out this video for an overview of CSM. Dell EMC is a trusted partner in data protection and we look forward to hearing from you.